Darning is a sewing technique for repairing holes or worn areas in fabric or knitting using needle and thread alone. It is often done by hand, but it is also possible to darn with a sewing machine. Hand darning employs the darning stitch, a simple running stitch in which the thread is “woven” in rows along the grain of the fabric, with the stitcher reversing direction at the end of each row, and then filling in the framework thus created, as if weaving. Darning is a traditional method for repairing fabric damage or holes that do not run along a seam, and where patching is impractical or would create discomfort for the wearer, such as on the heel of a sock. 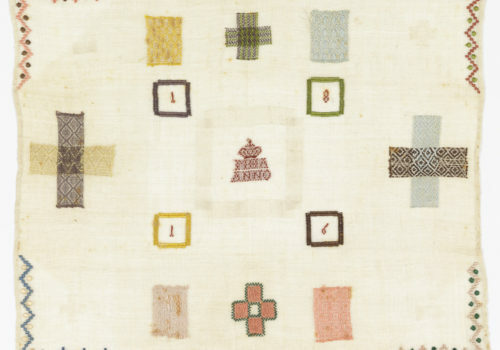 Fine darning, sometimes known as Belgian darning, attempts to make the repair as invisible and neat as possible. Often the hole is cut into a square or darn blends into the fabric. 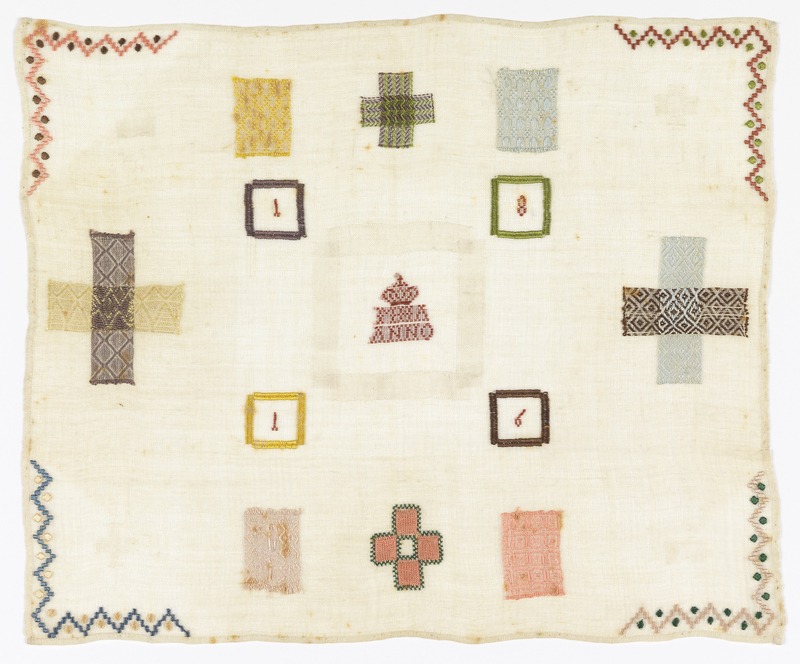 There are many varieties of fine darning. Simple over-and-under weaving of threads can be replaced by various fancy weaves, such as twills, chevrons, etc., achieved by skipping threads in regular patterns. In machine darning, lines of machine running stitch are run back and forth across the hole, then the fabric is rotated and more lines run at right angles. This is a fast way to darn, but it cannot match the effects of fine darning. A darning egg is an egg-shaped tool, made of stone, porcelain, wood, or similar hard material, which is inserted into the toe or heel of the sock to hold it in the proper shape and provide a foundation for repairs. A shell of the tiger cowry Cypraea tigris, a popular ornament in Europe and elsewhere, was also sometimes used as a ready-made darning egg. A darning mushroom is a mushroom-shaped tool usually made of wood. The sock is stretched over the curved top of the mushroom, and gathered tightly around the stalk to hold it in place for darning. A darning gourd is a hollow dried gourd with a pronounced neck. The sock can be stretched over the full end of the gourd and held in place around the neck for darning. Pattern darning is a simple and ancient embroidery technique in which contrasting thread is woven in-and-out of the ground fabric using rows of running stitches which reverse direction at the end of each row. 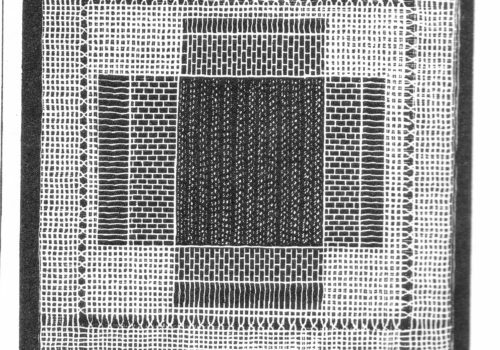 The length of the stitches may be varied to produce geometric designs. Traditional embroidery using pattern darning is found in Africa, Japan, Northern and Eastern Europe, the Middle East, Mexico and Peru. 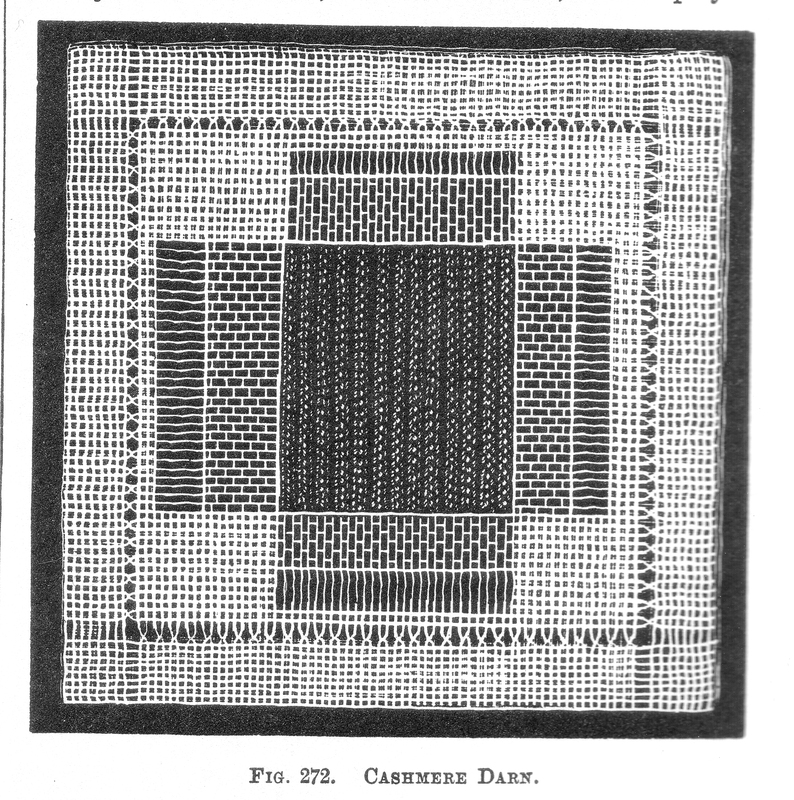 Pattern darning is also used as a filling stitch in blackwork embroidery. Net darning, also called filet lace, is a 19th-century technique using stitching on a mesh foundation fabric to imitate lace. Needle weaving is a drawn thread work embroidery technique that involves darning patterns into barelaid warp or weft thread.